On Sunday morning I opened my fridge to the quintessential first-world problem-more food than I knew what to do with: seven egg whites, a sad close-to-withering red bell pepper, one fennel bulb (what was I planning on doing with that? ), and a lonesome carrot. I usually chop all my veggies and throw them into an omelette, but there was a lot of veggie to be dealt with here. I haven’t mastered the omelette flip, and I really wasn’t in the mood for an omelette-turned-scramble. 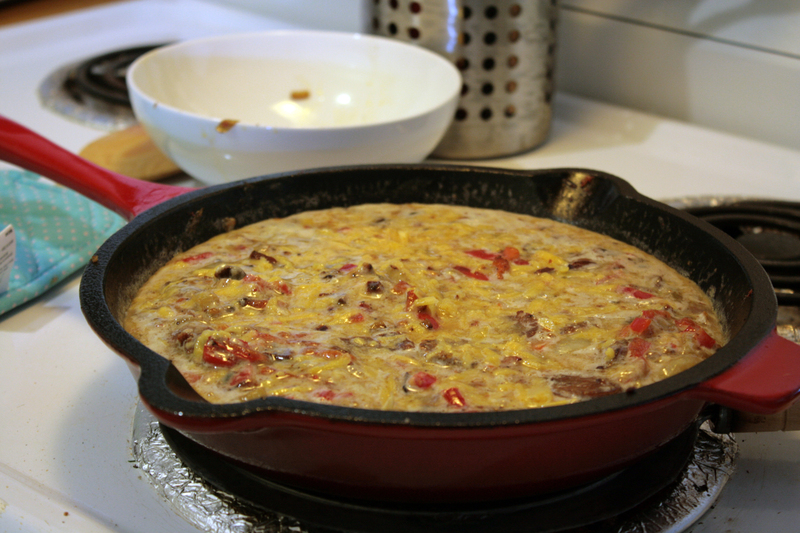 Then I remembered you can throw anything into a frittata without messing things up too badly! 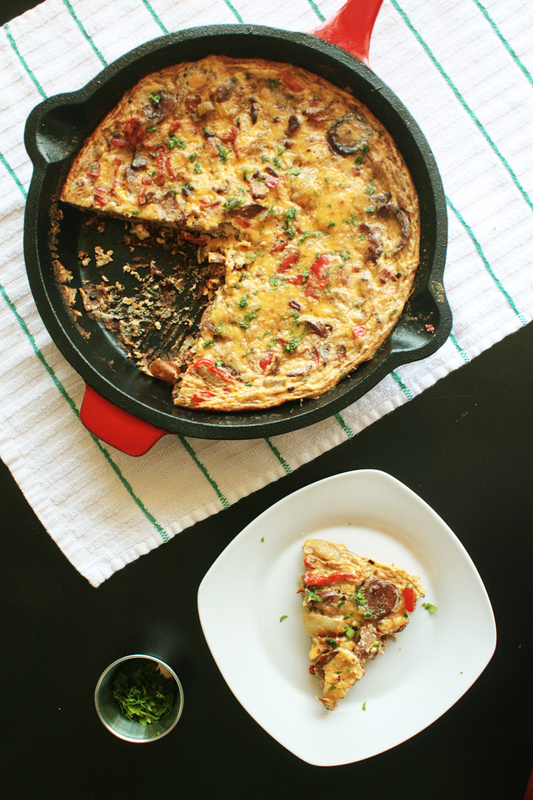 It was the perfect way to use up my veggies without resorting to over-stuffing an omelette. Here’s the recipe for mine. 1. Preheat oven to broil. Fry bacon over medium heat in cast iron skillet until crispy. While bacon cooks, dice carrots and bell pepper, slice fennel into thin strips, and chop up sausages. 2. 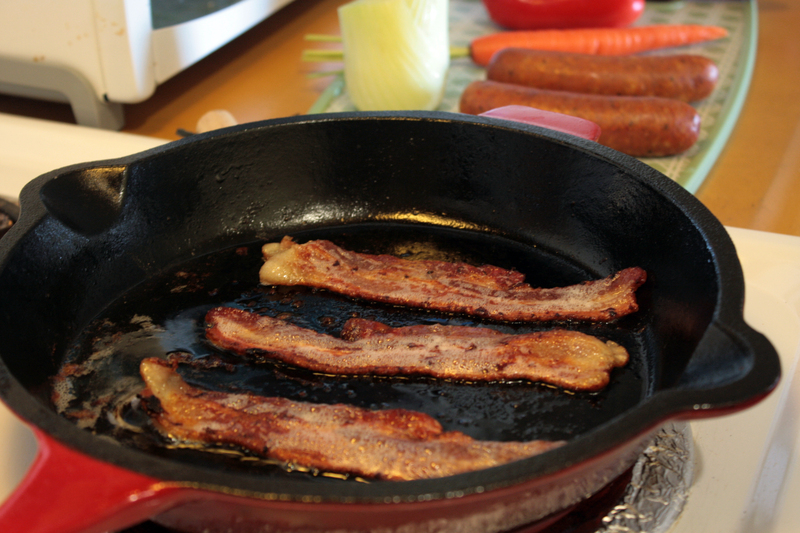 Remove bacon from pan, and place onto paper towel. 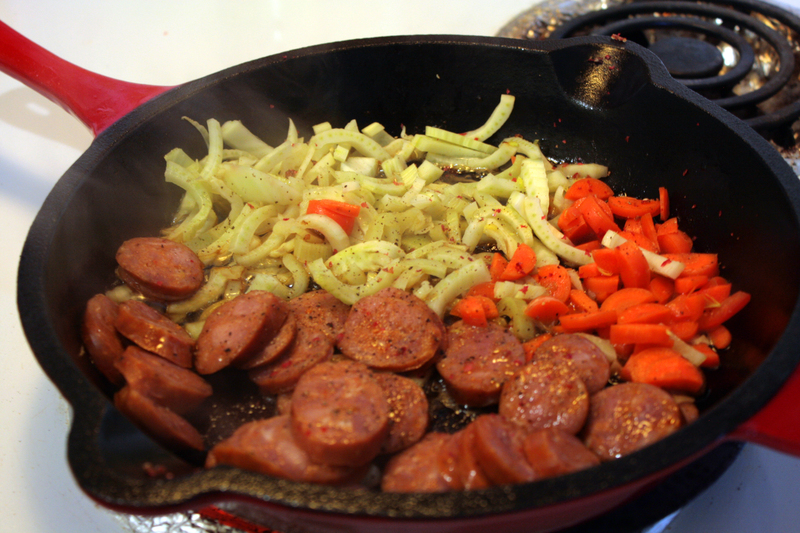 Cook sausage, fennel and carrots in bacon grease. Add bell pepper in about 5 minutes later. Season with salt and pepper. Watch and stir ingredients, cooking until vegetables are soft and the sausages are browned. 3. Whisk together eggs, milk, and cheese in a bowl. Roughly chop bacon. 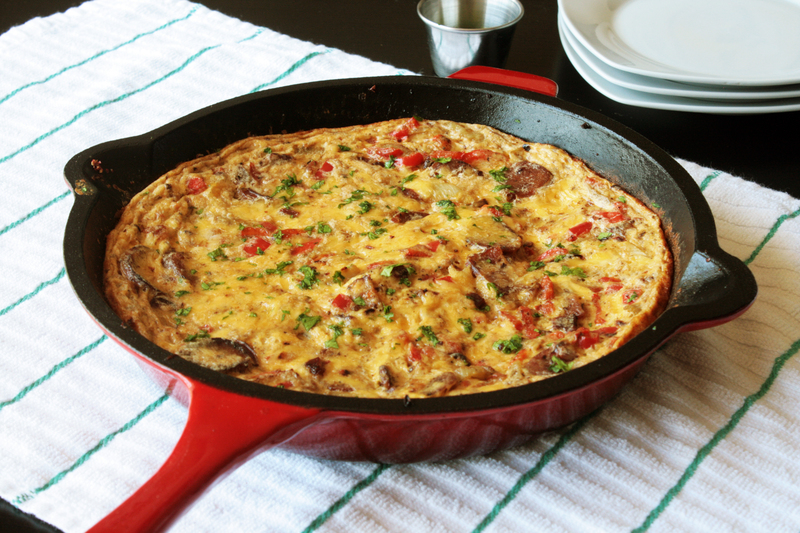 Add bacon and egg mixture to everything else in the skillet, stirring with a wooden spoon and making sure to scrape the bottom of the skillet. 4. Once the egg starts to stick to the bottom of the skillet, transfer everything into oven and bake for about 8 minutes, or until egg is somewhere between firm and jiggly. Remove from oven, and top with chopped parsley. Cut slices, serve, and start stocking up your fridge again! Does your cast iron have a on-stick coating? Every time I have bought cast iron in my life it has gone rusty no matter what seasoning process I try to follow. How do you clean yours? I seasoned mine with a pack of bacon, but I think the only way to prevent rust is to always wipe it down after washing it. I’ve read that you’re not supposed to use soap because this gets rid of the seasoning (I know, it weirds me out), so if anything gets really stuck to my skillet, I use warm water and a hard sponge, then wipe it down immediately. I love the concept behind this! I’ll definitely think of doing this next time I’m looking to use up some food in my fridge. Looks delish!